I have a friend that is introduced as, "This is Dee Dee, she's been my friend since pre-school." It's true...however we were the parents of two pre-schoolers. not the actual pre-schoolers. Dee Dee and I have gone through lots together. We've cried together, supported each other emotionally and laughed together. We raised our kids together and when I re-married and moved away, I thought neither of us would survive being so far away. Three years ago, Dee Dee moved to Colorado. Even though she lives over 1000 miles away we still find the time to visit, either by phone or by Skype, and on those special times she comes to northern California or I go to Colorado. Dee Dee is very talented. I have trouble painting a room, she thinks nothing of laying tile. I've always had such respect for her talents. 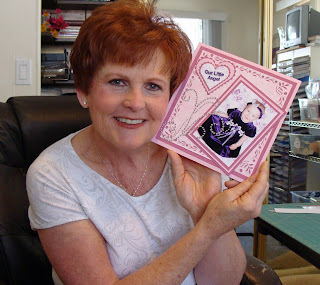 When Dee Dee comes to visit, we spend hours and hours scrapbooking or making cards. She goes home with what she's learned and creates master pieces that her grandkids will cherish for many, many years. Yesterday Dee Dee told me about a gift she received for Christmas and that she was making a card for her sister, to say thank you. I asked her to share her card by sending me a photo. Below are the photos she sent. I'm so proud of her. She doesn't have a group of women to network with her. She works full time and spends much of her free time with her grandkids. Her free time is very limited...What she's learned she's learned by looking at things she likes and then expands on the ideas she's seen. I think she did a fantastic job on this card and I'm sure her sister will be thrilled when she sees it. I'm looking forward to when we can spend another long weekend playing with paper....Dee Dee, Thanks for sharing your work! Once again....have a wonderful week. I just discovered your blog and LOVE your creations! 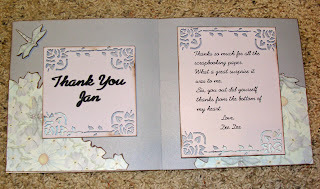 Since I am also a grandmother who teaches a card class (weekly) I look forward to CASEing some of your designs. (Hope you don't mind!) You are now on my bookmarks list--do visit my blog when you get a chance.